Meteor is a classic ‘Crazy Cage’ ride, built in the late 1970’s by Sam Ward, and still thrilling riders to this day. Great for both onlookers and riders, Meteor will thrill and excite with dazzling lighting and lifting to great heights. 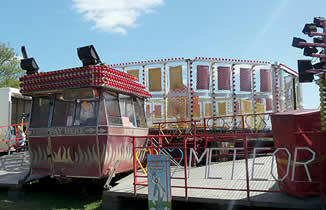 Quick and easy to set up with a striking appearance, this ride is very popular amoungst thrill seekers.